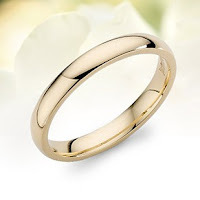 Some time in November, I suddenly became aware that I'd lost the ring I'd bought to commemorate my dedication to God as a single woman living and working in the world. I say "suddenly" - it was quite a shock to realise that my ring finger was completely bare. At first I assumed it had slipped off in the night when I'd had my hand under my pillow. I was sure that I'd find it again when I got home. It wasn't there. I looked in all the places I could think of. I even thought that the cats might have found it, and after a game of chase, have left it under a cupboard. I scoured the flat, without any joy. I checked my jacket pockets, my handbag, and my coat pockets. I prayed to St. Anthony. Nothing. I even checked my gloves in case, in my haste to take them off, the ring had remained trapped in the material. By the end of December, I gave the ring up for lost. I assumed that I had pulled it free when retrieving my ticket on the train, and that it had dropped to the floor unnoticed. On Saturday I decided to buy a replacement. The original had been an inexpensive gold band from Argos, and, as I was in Victoria, I popped in to the Argos branch there. Alas, they didn't have the ring in my size, and I had to abandon the idea.